If you’re like me, and you’ve been obsessing lately about how you want to spend more time being “creative,” but you are stuck trying to figure out what that really means for you, this is your guide. This book truly is a guide for unleashing the creativity you possess, but have repressed. I’m sure that each person will focus on different chapters and messages in the book, and each person is going to take something different from it, but that is the beauty of it. 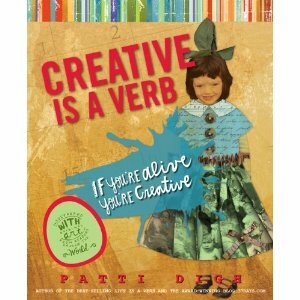 Patti Digh has given us a gift in this book – permission to not have to follow any rules, or complete any set schedule, on the way to a more creatively fulfilling life. The exercises are meant to inspire and motivate, but not to make people feel inadequate or frustrated. It encourages us to live our whole lives artistically, not just while were painting, singing or writing. Without a doubt, this gorgeous little manual gives us power, choice, and some really fun stories to enjoy and think about. Not to mention, the graphics are exquisite. The photographs, drawings and quotes make this book a work of art in itself. A story that particularly stands out to me is one where the author describes a dream that her young daughter had while she was away on business. The daughter tells her mommy that she had a dream that she was a little fish in a big ocean, and couldn’t find her mommy. This story was a wake-up call to Patti. She realized that she need to listen to her heart and follow a new path, and it took her daughter’s dream to send her this message. So, she tells us, “Listen to tiny fishies.” It’s her way of encouraging us to listen to the messages life is trying to tell us – the messages that beg to be listened to. The exercises that follow this story were particularly profound to me personally. Maybe you will gain something from what they are trying to tell you, too.